Once when I was feeling less than pretty, it occurred to me, “Who told you that you aren’t beautiful?” I began to wonder, what if our differences actually are a gift? What if what’s unique about us is what makes us beautiful? When we let go of our preconceived notions, we’re free to enjoy our individuality. 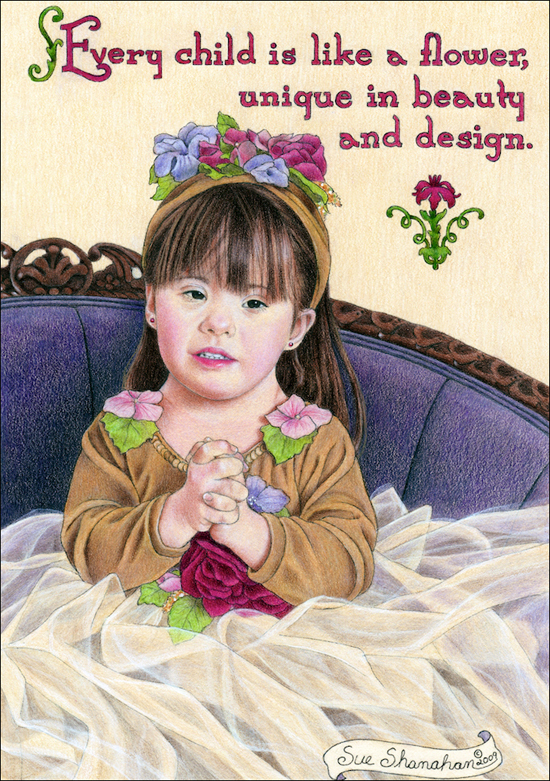 I am thrilled with the trend of using children with disabilities in ads. I love that the world is waking up to the truth that beauty comes in all shapes, sizes and colors. The illustration above is based on a photo I snapped of a friend’s daughter, Clare. 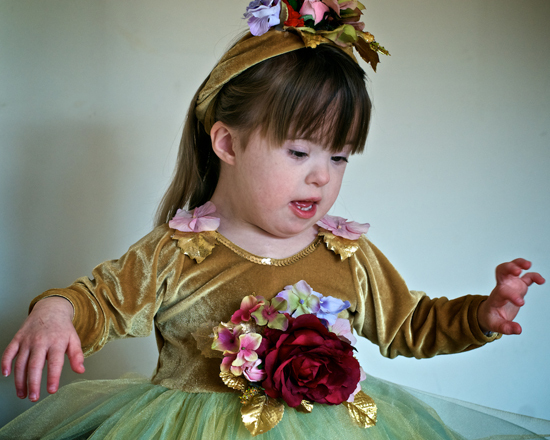 Her mother needed her photographed for a calender featuring children with Down Syndrome. After adjusting the layers of netting on Clare’s party dress, I saw a longing in her mother’s eyes. Maura had the same yearning every mother has for their child. 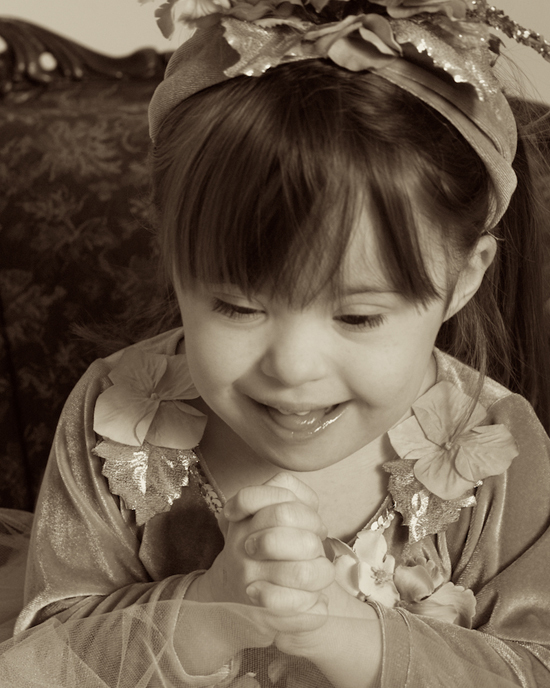 She wanted her little girl’s beauty to be appreciated. I, in turn, was smitten with Clare. Looking at the photographs from the session, compelled me to design an illustration around her. Yes, being beautiful is no longer for the chosen few. I love your thoughts, so simply and beautifully expressed, and I appreciate the conciseness and brevity. The photographs are exquisite, and lend an engaging quality to your new blog. Congratulations! Absolutely beautiful! Thank you for sharing your talent. I love this Sue! You’ve touched my heart with your words and your art! I love reading your thoughts and inspiration behind your beautiful illustrations. It really brings them to life. Clare is a darling little girl! No doubt her mother was as thrilled with your illustration of her as well as the photo. And the quote with the illustration is perfect! I was touched by your pictures and quotes. Absolutely beautiful. Love the flower idea. Wish i’d been named for one. Now that made me laugh, Iris. Sue, I love the black and white photo of Clare. You beautifully captured the joy and glee of a child secure in love. Sue, you are truly a gifted photographer as well as artist and writer. Nothing shows all three as well as this blog! I was surprised that it was originally written on our 43rd wedding anniversary which just makes it that much more special! Most of my working career was with children and adults who experienced a multitude of physical and mental *’otherabilities’ and I loved each one of them very much! THEY gave me so much more than I was ever able to give them. My best gift to each one was to simply accept them as they were, not needing them to make any changes for my love to continue. There is an author, Barry Neil Kaufman, who back in the 70’s, had a son who was diagnosed with Autism. He and his wife decided they would work with him as much each day as possible. They were able to hire assistants to do some of the work and this child received appropriate stimulation most of his waking hours. There has been a great deal of discussion as to whether his son ‘really had autism’, but at any rate, they were able to bring him back from wherever he had gone into the world most of us naturally accept. The concept they began with was ‘TO LOVE IS TO BE HAPPY WITH’. If nothing ever changed, if this child stayed just as he was for the rest of his life, they knew they would love him as he was, rather than making that love into a goal of making him better. I am reminded of this with your story today. I was always uncomfortable when someone ‘complemented me’ on how wonderful I was to work so well with ‘those’ people. Indeed, I was wonderfully blessed to have discovered, via a dear friend’s husband, just what I wanted to do with my life. Thanks once again, Sue for ‘hitting the nail on the head’! * I do not like the word ‘DISability’. To me it diminishes the person. Rather, we ALL have abilities and it is up to each of us to find that ability and build on it. What a beautiful young lady. I agree. Beauty comes in all shapes and sizes.